Susan Ko has spent more than twenty years creating and directing faculty development programs for online teaching at diverse institutions, including City University at New York and University of Maryland University College. Steve Rossen, Instructional Technologist and Electronic Librarian, was formerly Manager of the Faculty New Media Center at UCLA. Teaching Online: A Practical Guide is an accessible, introductory, and comprehensive guide for anyone who teaches online. The fourth edition of this bestselling resource has been fully revised, maintains its reader-friendly tone, and offers exceptional practical advice, new teaching examples, faculty interviews, and an updated resource section. spotlight on new tools and categories of tools, especially multimedia. 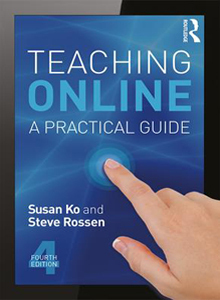 Focusing on the “hows” and “whys” of implementation rather than theory, the fourth edition of Teaching Online is a must-have resource for anyone teaching online or thinking about teaching online.